From a youth I have had a keen appreciation for antiques… sort of. Let me explain. While I do appreciate fine antique furniture and ornate wrought iron gates it is the tools used to create them that have always intrigued me. I have a growing collection of antique tools that I love to use. I am not one to buy an old tool and put away only to look at it or show it off to visitors- I put them to use. From my anvil that was made in England in the 1830’s to old chisels and hand planes (some of which were made before the Revolutionary War) I use them to do the tasks for which they were intended. 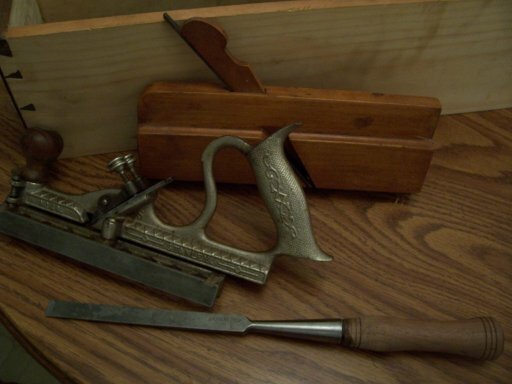 One of the first rules of hand tools or any tool for that matter is to use it for its intended purpose. I once saw someone take a finely honed 19th century Lakeside chisel and scrape a sticker off a metal lunch pail. YIKES! In Proverbs 22:6 we are told to “Train up a child in the way he should go and when he is old he will not depart from it.” Wow, those words can either be an encouragement to parents or worrisome. It mostly depends on how you read it. So the writer of the wisdom in Proverbs 22:6 is basically admonishing parents to look for where the child is naturally gifted and then to encourage and assist them in exploring that gift. Think of another type of tool, a bow, if one wishes to launch an arrow with a bow one must draw the bow the way it is “bent”. If one were to draw the bow a different way from how it is bent the bow will perform poorly and may even break. Our children are certainly not tools that we use but they, like a finely set Isaac Field smoothing plane, must be carefully observed and encouraged to do what they were created to do. Some children love mathematics, some love animals, some love to act and entertain, some are gifted musically. Whatever gifts the Father, Son, and Spirit have given your kids encourage them, in any way possible, to chase their passions and even when they are old they will not depart from it. This is absolutely stunning, Bill. It’s amazing, because just when I had given up on the Bible in some cases for being too conflicted, I have been learning more about what was truly meant. It changes everything, and you have done that for me here. Beautiful perspective – so different from the usual interpretation of this verse. iamjean9, thanks for the compliment. Yes indeed when we are sure of our standing with the Triune God of Love we are then free to reconsider much that we’ve been taught about God that may not align with the true character and nature of the Father, Son, and Spirit. Upon reading the title I thought, “Oh, not this again” and I almost deleted it out of hand. We were told that “the way they should go” was some kind of legalistic burden, a burden which I fought hard to overcome and determined never to go back to. But I read the article anyway and was pleasantly surprised at how liberating it is. I suffered from my own dad trying to make me into something I was not created for. I eventually found my own way, but having gone through this struggle I was determined not to inflict it on my own three kids. I am now the proud dad of three very different kids who have excelled in three very different college degrees. My youngest is in his third year of college and he just got a very fine job offer yesterday where he’s going to work this summer after which he will return next fall to complete his engineering degree. Praise be to God for His wisdom. dbdweeb, I hear you. I grew up in legalism but thankfully my parents encouraged me to pursue my passions. Your kids are lucky to have a father who apparently recognizes that we cannot undo the past but we can learn from the past and so make it a wind at our backs.